Roemheld syndrome (gastric-cardia syndrome) is personal for me. I know the condition exists even with the little information out there provided to us about it. I suffered from it, and it caused me to have poor heart health for a time and arrhythmia. I believe that the syndrome exists strongly because I suffered from the syndrome after my son Abel died and it was hell. My son Abel had passed away a month before I felt the dreaded symptoms of gastric cardia syndrome. My silent reflux had come back in spades from all the stress. All of a sudden if I overate my heart rate would dip, then shoot up to 150+ bpm. My blood pressure would also go sky high. Why is this happening to me? I started to notice some patterns over time. When I drank water, and when I burped, I felt better. When I took magnesium or had a bowel movement, I felt better. When I slowed my breathing and ate less, I also felt better. I did not know about the gastric-cardia syndrome at the time, but I went on a restrictive low-FODMAP, Dropping Acid diet. Both of the diets reduced bloating and upper gut inflammation which relieved my symptoms. In a few months I lost weight and got my digestion under control, the symptoms disappeared. Roemheld syndrome is well known in Germany, but not much of it is known outside of Europe. I hope I can spread awareness about this cruel, debilitating disease. What Is Roemheld Syndrome and How Serious Is It for Your Heart Health? Roemheld syndrome is also known as gastric-cardia syndrome and was discovered by the German medical internist Ludwig Roemheld in the 1930’s. Simply put it is a condition where poor upper gut health leads to cardiac symptoms and issues. Ever felt a very low or very high heart rate during or after eating that was relieved by burping? Ever felt your heart skip multiple beats or have chest pain and trouble after eating a large meal? You probably suffer from gastric-cardia syndrome. Most of the following symptoms of the syndrome seem to occur after eating, mainly if you consumed a large meal. Some people have also reported their symptoms to occur after strenuous activity, when excessive pressure is applied to their abdomen, or when awoken with dyspepsia during the night. If you are showing symptoms of Roemheld syndrome your healthcare professional will run tests to determine your cardiovascular health and if you are having gastrointestinal issues, run tests to determine the possible origin as well. A cardiologist might run the following tests to assess your heart health including an electrocardiogram, 24 hour Holter monitor, cardiac scan (MRI or CT), echocardiogram, and blood work. If your heart appears to be healthy, you might be referred to a gastroenterologist if you are also suffering from gastrointestinal issues. A gastroenterologist might run a few tests as well to determine your gastrointestinal symptoms including an abdominal ultrasound, abdominal scans (CT, X-ray, MRI), and an endoscopy procedure. Most of the time the only issues found by the gastroenterologist is reflux or a hiatal hernia. Roemheld syndrome has a few mechanical triggers. The primary mechanical trigger occurs when excessive pressure is placed on the fundus of the stomach, moving in upward displacing its anatomical position. With increased epigastric pressure the diaphragm’s position elevates and puts pressure on the heart, lungs, and vagus nerve. Hiatal hernia’s are known to be a significant mechanical trigger of the syndrome and shift part of the stomach upward putting pressure on the diaphragm. Finally, adhesion’s, anatomical surgical modifications, and meshes from gastrointestinal surgeries (including gastric bypass, hernia repair, and anti-reflux surgeries) may also displace the organs in the epigastric region which can also trigger gastric cardia syndrome. Another mechanical trigger of the syndrome is increased pressure put on the vagus nerve. In addition, if someone is suffering from esophageal reflux, inflammation associated with that can further cause pressure and vagal nerve irritation. When excessive force is placed on the vagus nerve, heart rate and blood pressure may widely fluctuate. When your heart rate and blood pressure drop the body’s autonomic nervous system is activated by a catecholamine dump into the bloodstream to increase it. The increased circulating catecholamines cause a massive increase in blood pressure and heart rate for some people. Unless an underlying arrhythmia is triggered, the fluctuation from low to high cardiac pulses and pressure may be undetectable unless you are actively monitored during an attack and can be easily mistaken as anxiety. When an attack occurs, strong coronary reflexes happen, causing a lot of the cardiac symptoms associated with the syndrome and if the heart is stressed enough a heart attack or atrial fibrillation may occur! “Neural reflex arcs from the oesophagus and the heart have been shown in both animals and humans. 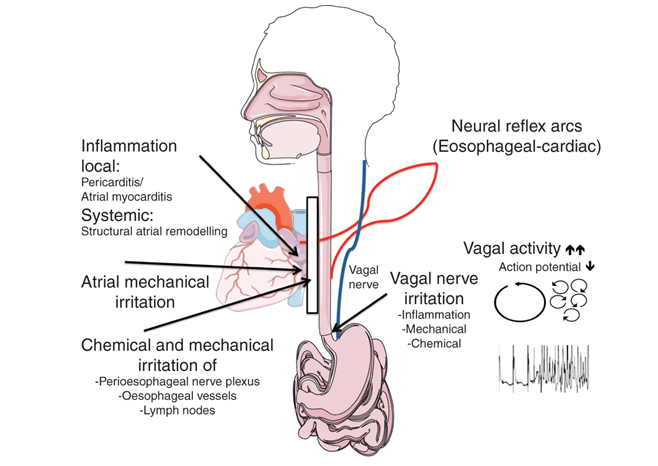 In humans, chemical, electrical, and mechanical stimulation of the oesophagus modifies the sympathovagal balance. Oesophageal stimulation amplifies respiratory-driven cardiac vagoafferent modulation, while decreasing sympathetic modulation. Oesophageal acid stimulation is further associated with an increase in vagal activity.Acid refluxes cause a local inflammatory process that may directly alter the autonomic innervations of the oesophageal mucosa and may also penetrate the oesophageal wall and stimulate the adjacent vagal nerves. Injury of the distal oesophagus can further impair vagal nerve responses, particularly nerve sensitization of the afferent pathways. These and other considerations suggest the involvement of the cardio-oesophageal reflex in case of GERD associated AF. Excessive gas and bloating from dysbiotic flora in the small intestine and upper gut increases epigastric pressure, leading to the stomach moving upward triggering the gastric cardiac syndrome. Hydrogen, methane, and hydrogen sulfide production from fermentation by dysbiotic flora increases bloating especially if one ingests a diet high in FODMAP’s (fermentable oligo-, di-, monosaccharides and polyols). Finally, obesity can also play a role in triggering Roemheld syndrome by increasing both the risk for developing a hiatal hernia and cardiac issues. Over time the syndrome can lead to a weakening of the cardiovascular system that might lead to cardiomyopathy and congestive heart failure. It can cause an arrhythmia to develop including arrhythmia that is mostly benign including sinus tachycardia to severe as atrial fibrillation. The syndrome in people may cause heart disease and eventually heart failure. If a hiatal hernia causes your gastric-cardia syndrome, try to work on getting your stomach to remain in a correct anatomical position. Reduce stomach and intestinal tract boating. If symptoms are severe, you might want to try a FODMAP diet to reduce fermentation and bloating. Some people might need to reduce protein consumption to fifty grams it bloats you as well. Relieve SIBO or upper gut dysbiosis if you are suffering from it. Taking activated charcoal may reduce bloating from absorbing excess gas. Taking digestive enzymes may help reduce gas formation. Make sure your stomach acid pH is optimal as well. Relieve constipation. Constipation can increase abdominal pressure which can push the stomach upward causing Roemheld syndrome. Chew your food thoroughly and eat slowly. Do not overeat when you are full. Try not to consume more than four to six ounces of a beverage at meals to help prevent bloating. Consume a majority of your beverages a few hours after a meal when your stomach is emptier. If you are suffering from gastroparesis, try to improve your stomach emptying if possible. Consuming ginger tea or taking one New Chapter Ginger Force after a meal may help enhance stomach emptying. Improving vagal tone might improve gastroparesis as well. If you need to burp, make yourself by swallowing a little bit of water and try to make yourself burp. Most of the time burping relieves the symptoms of Roemheld syndrome. Exercise regularly to strengthen your heart and supplement with magnesium and maintain proper intake of dietary omega 3 fatty acids to help reduce chances of developing severe heart arrhythmia. Try to sleep on your back or side at all times if possible. Some people have fewer symptoms of Roemheld syndrome sleeping on their left or right side. Laying on the right or left side during an attack may provide instant relief. For most people laying on the right side seems to help more, even if that is counterproductive to sleeping recommendations individuals who have GERD. Strengthen your diaphragm and improve your breathing! Strengthen your LES and UES (upper esophageal sphincter) tone if they are weak. Most people suffering from GERD have weak LES tone, and most people suffering from silent reflux have weak LES and UES tone. Try your best to lose weight if you are overweight to reduce increased abdominal pressure from excessive fat tissue and to improve cardiovascular health. Information is limited on gastric-cardia syndrome so please if you find any relevant studies or books pertaining to the condition, leave a comment below. Thank you. Enders, Giulia, Gut: The Inside Story Of Our Body’s Most Underrated Organ, Greystone Books, 2015. Which type of magnesium is best RS? I found this article online (never knew there are so my different types of magnesium). So, I had a virus in Jan ‘17, which caused GERD. Oct ‘17 I developed Gastroparesis and SIBO. In April ‘18 The Gastroparesis seemed to subside, but I still have SIBO. For the past week, GERD and Silent Reflux have been acting up. I feel a sensation in my gut that travels to me chest. Today, after the sensation traveled to my chest, it caused my heart to jump. It happened twice this morning m, again an hour ago, and now I still feel like this heart feeling is looming. Does this sound like RS? Hmmm, this sounds like exactly what I have. Maybe this has nothing to do with it, but when I’m on the treadmill and wearing a heart monitor, I notice my heart rate slows down about 10-20 beats when I burp. I wonder if that establishes a connection between the gastro, vagas nerve, and cardio? And just like the symptoms say, I’ve had periods of bradycardia, tachycardia, dizziness, fatigue, light headiness, and more. Nothing ever shows up on the ekg or labwork. But it all started with gastro problems. Sounds like Roemheld Syndrome to me. Google Sanjay Gupta York Cardiology. Watch his videos, particularly the one on gastric-cardia. The guy is brilliant. Such a relief to find a doctor who does not scoff at this condition. It is clearly a VERY complex condition with a long list of triggers that vary person to person. Stress definitely is one or at least a contributor, but it is NOT a sole cause. Foods, drinks (caffeine, alcohol) are major contributors. You will need to carefully determine which you are more susceptible to. There is a lot of indirect research/info out there on food allergies and irritants which people with Roemheld clearly must be wary of. The important think is to rule out actual heart issues and then stop worrying about your heart and focus on the digestion, stress. Not much on it in the US, which is typical, since it is not a killer BUT Roemheld is REAL. @Tony, thanks for discovering the Gupta videos. Not all of them are are his website http://yorkcardiologist.com/page6.htm — a lot of them are on YouTube and even at http://www.mashpedia.com/Roemheld_syndrome. Sigh, would that all doctors had his ability (and willingness) to clearly explain medical concepts and conditions to patients. Thanks Dr G for providing these online videos! I too have RS,that kicked in after my dad died. Stress is a huge part of this. But when you have the weight of the world crashing down on your shoulders what do you do? You slouch. Your breathing shallows out. With my Rs I also noticed what could be described as esophagus twitching. On slouching,the esophagous is compressed. The vagus nerve is compressed,the gas in the gut is compressed. And pushes. IMHO you cannot cure Rs without correct posture. Posture controls breathing. Two years ago I became very ill, with constant episodes of sudden dizziness, heart pounding, hot flushing, etc. I did ER visits several times and they had no explanation. It all went away and now it’s back with a vengeance. I’ve had miserable Gerd, and I feel sure I have a hiatal hernia causing all this by pressing on my heart and vagus nerve, but I just had an endoscopy and they didn’t see the hiatal hernia. I’ve read it’s very easy to miss it, if it’s a sliding hiatal hernia. I’m 57, and 30 pounds over weight – mostly in my belly. I can’t stress enough that these episodes feels life threatening, and my heart pounds and then suddenly struggles to continue beating. My blood work up showed low b-12 and d, so I started supplements. I am scared and wonder if weight loss would help. I had a bad cold this week with hard coughing and I swear I can feel something laying along my esophagus on the right side. Was referred to you from Bulletproof and came across this article. I’ve been Bulletproof for a few months with great benefits, but am burping quite a bit after morning coffee. I notice hot flashes after onions or fennel. Now, thinking it might be Roemheld brought on by sibo, I am trying to limit fodmaps, but the grass fed butter, BP coffee, BP vanilla, and xct oil are all low fodmap, and I still burp after it. I’m taking peppermint oil and probiotic, and it helps a little but not completely. Should I eliminate the oil? Go on a whey protein 3 day fast? Hiya, I have just discovered the condition ‘Roemheld syndrome’ and am wondering if i have it..
by a few heavy heartbeats with a head rush then back to normal, this happens when swallowing (food feels stuck, just before stomach) or burping for want of a better word! They discovered I get 3rd degree AV heart block lasting between 2 and 7.2 seconds! to the cardio dr who said: “I cant stop you from swallowing food, you need this pacemaker. I agree with you that you are probably suffering from Roemheld syndrome. I would look into uppergut overgrowth causing the issue like H. pylori, Citrobacter, or Proteus mirabilis. I would look into reducing uppergut overgrowth and maybe trying to test for it by getting a GI Effects test or http://biohealthlab.com/test-menu/parasites-and-pathogens/gi-pathogen-screens-401-401h/ for H pylori. I would talk to your doctor about taking magnesium and ubiquinol / PQQ for your heart and make sure your 25-hdroxy (vitamin D,) 1-25 hydroxy, and vitamin b12 levels are normal. Good luck! This sounds familiar to me. I think that I have experienced this on occasion, especially after going through two pregnancies in two years, which I know severely weakened my abdominal muscles (affecting the diaphragm)? When digestive health is optimal (zinc plays a big role in that for me), all is well. And, in fact, I can’t say that I’ve experienced this so much in the past couple of years. I have a slight abdominal bulge from the pregnancies that comes and goes (I had diastasis after both pregnancies. I’ve also noticed that it goes when my core is strong and my posture is correct), and I have had numerous people in healthcare positions tell me that it’s not a hernia. I don’t know, but i have seen it disappear and reappear with correlations to how I am feeling overall. My question is: would core strengthening exercises be helpful for this condition? This sounds like me to a T. I’v seen 3 cardooglists and done almost every heart test short of a catheterization with no explanation for my chest pain, palpitations, shortness of breath and other symptoms. I do have a lot of upper GI symptoms including burping and bloating and will be seeing a gastroenterologist soon to check for a possible hernia or infection. Hi there i would like to share a remedy for roemheld syndrome see if it can help..coz it has helped me to..take some black mustard seeds and dry roast them in a pan and as they start popping up put some water immediately and then filter this water removing the mustard seeds and drink this water..atleast one glass..